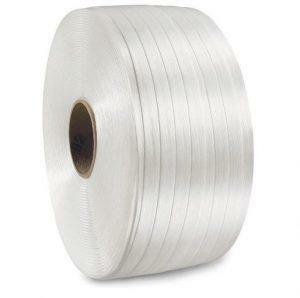 Strapping is an excellent solution for securing shipments during transport or for medium or long-term storage. There are 3 main uses of strapping; to fix to a pallet, to join one parcel to another, and to offer more strength. It can be used to secure almost anything, from fragile products to bulky loads. But with so many different types of strapping available, how can you make sure you’re using the right type? This post will explain exactly how, offering advice and tips on selecting the right strapping for you. After a cardboard box has been sealed with tape, even if it is a sturdy cardboard box, strapping can be applied to secure it fully. It wraps all the way around the parcel, and the join is bonded or welded together to provide a tight, strong seal that can’t easily be broken. It can easily be applied no matter the package size, on everything from standard size cartons to large export boxes and pallets. It’s particularly useful when fixing a couple of cartons together – it’s then considered as one parcel so reduces shipping costs. It’s also ideal for bulky and heavy items, where something stronger than normal packaging tape is needed for a secure fit. Strapping can be applied manually using strapping tools or with the use of a strapping machine for a fast and efficient process. Top tip! If you use a strapping machine no additional tools or seals are required to fasten the strapping, the machine will automatically friction weld the strapping to the seal. For manual strapping, equipment is required to create tension in the strapping and seal it securely. For businesses shipping varied products ranging in shape and size, a tensioning tool combined with sealer tool and seal will complete the packing process, and the handy feature of using it vertically means you can reposition yourself for awkward loads. Combination strapping tools are available which simplify the process combine both a tensioner and sealer into a single tool, to only be used horizontally it makes packing straightforward for securing same-size and shape products, seals are also required. 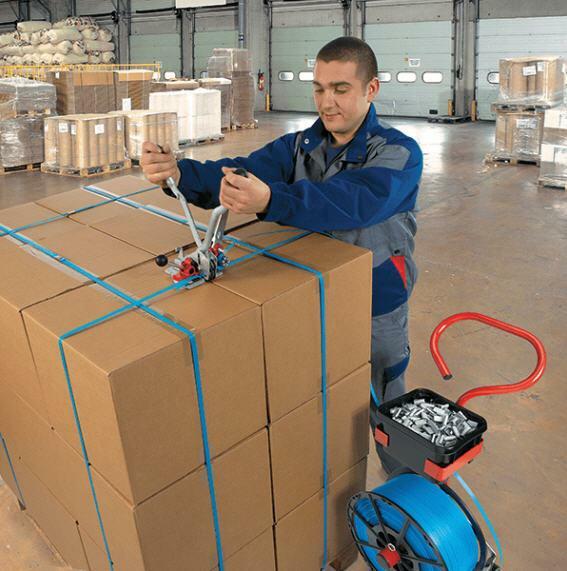 Hand strapping machines are ideal for a variety of packages; they’re highly versatile for different size and product variations, mobile and can be used vertically and horizontally. For packaging lines that need to strap large volumes of packages then a strapping machine is highly recommended. Semi-automatic strapping machines and automatic strapping machines are available, with the high performance automatic machine able to produce up to 65 straps per minute. They greatly speed up the strapping process by automatically tensioning and sealing the strapping, reducing the time it takes to seal boxes. There are several types of strapping available and to get the best results you need to ensure you choose the correct type that offers the benefits needed for your packaging operation. What is the application and how do you intend using it? What is the weight, and is it a static or dynamic load? Will the strapped shipments have to withstand any particular weather conditions? Will the strapping be done manually with tools or will it be done automatically with a machine? How far is it going and will long will it be strapped for? We’ve summarised the different types of strapping below, so you can learn the properties and advantages of the different materials, listed in increasing order of resistance. This should help you make the right decision when buying strapping – and if you’re still not sure, then please do give our team a call on 0800 542 44 28 and we’ll be happy to help. PP or polypropylene strapping is very light and versatile, making it ideal for sealing, reinforcing and securing lighter loads. 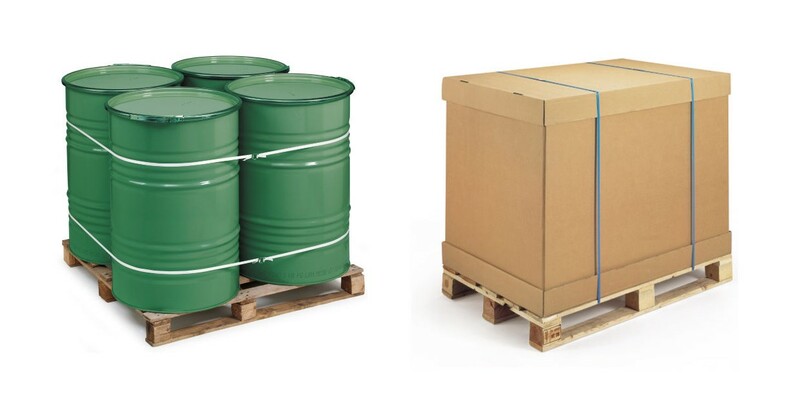 With elastic properties, it does not deform or corrode and resists bumps and scrapes making it ideal for use on pallets that will be stored for long periods of time or shipped long distances. It offers a resistance of up to 250kg and its light, plastic properties make it easy to work with. It can be sealed with self-locking plastic buckles and security seals. Top tip! If you are using a manual, automatic or semi-automatic strapping machine, only polypropylene machine strapping can be used. PET or Extruded Polyester Strapping is the strongest type of plastic strapping available, making it ideal for fixing heavier loads and pallets. Because it’s made from polyester it can be secured very tightly, with a small flex in the material that can be tightened when sealing. It has strong resistance to moisture and UV rays which make it ideal for long-term storage where high strength is required for long periods of time. 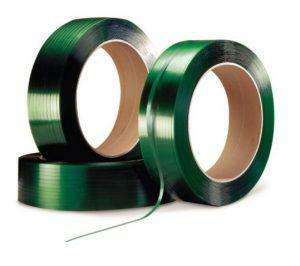 It offers a resistance of up to 340kg and can be used to replace steel strapping in many situations. Made from a minimum of 80% recycled materials, it’s more eco-friendly than other strapping materials, and can be sealed using tensioners and sealers. Among the strongest strapping available, steel strapping is tough and perfect for heavy, rigid loads with sharp or rough edges like iron or concrete that won’t compress. The properties of steel strapping mean that it won’t flex like other materials can do – this is why it’s ideal for solid, bulky loads. Top tip! Recommended that the person packing wear industrial gloves for protection. 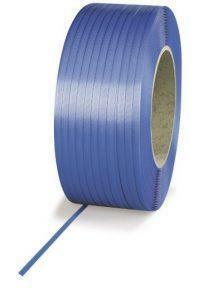 This super-resistant strapping is ideal for very heavy loads of up to 740kg can be sealed securely with or without seals. 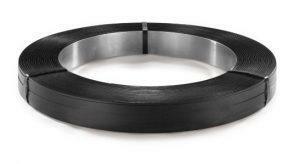 This industrial strapping can only be used with steel strapping tensioners, sealers and combination tools. The most resistant of strapping materials, corded polyester strapping is ideal for fixing and sealing delicate or fragile products. Its light, textile material means it’s easy to work with, it won’t rust, rot or mark surfaces, and is best used manually with tensioners and sealers. It offers extreme resistance for loads of up to 950kg and is highly resistant to tearing making it ideal for heavy loads. Also, by dividing it over the length, a knot can be made in the strapping to further increase the security of an item after it’s been sealed. If you’d like more information about the strapping we have to offer, manual tools, strapping machines, systems or advice on which strapping is right for your operation, simply get in touch with our team of packaging experts who are on hand to help. This entry was posted in Packaging Industry News and tagged advice, boxes, business, cardboard, fragile products, machines, packaging, rajapack, seal, security, shipping, shipping costs, strapping, strapping machine, Strapping machines, strapping tools on June 25, 2018 by Rajapack UK.